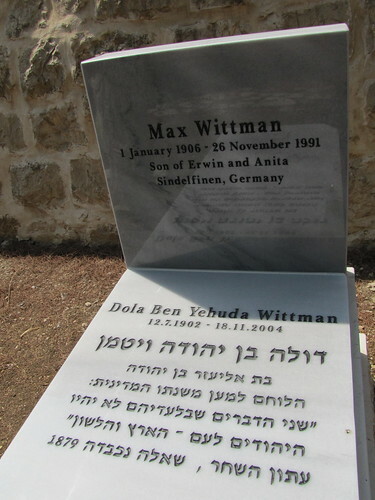 Finally, after a wait of quite a few years, the new grave marker for Max Wittmann and his wife, Dola Ben-Yehuda Wittmann, is finally in place. Dola Ben-Yehuda, who lived to be over a hundred years old, was the daughter of Eliezer Ben-Yehuda, the man who revived modern Hebrew. I hope that they fix the name of Max Wittmann’s city of origin, which is unfortunately misspelled on the gravestone. It should read "Sindelfingen." painful, but they spelled it wrong, town's name is Sindelfin(g)en, where Daimler comes from. Yes, you're right. I hope they correct it. The last name is also spelled incorrectly - "Wittmann" has two n's.